FM19 Cheap Wonderkids – Signing the best young talent for low prices in any version of Football Manager is essentially the reason why many play. Everyone loves to buy a player for a cheap price and watch them flourish into one of the world’s best. But in most cases, clubs will demand inflated transfer sums, like Liverpool, who often demand a fee in excess of £100m to sign Divock Origi, despite the fact his contract is expiring in at the end of the season. The point is, some players can’t be purchased without a hefty bank balance, but other less-heralded but equally impactful players can be signed if you know where to look. 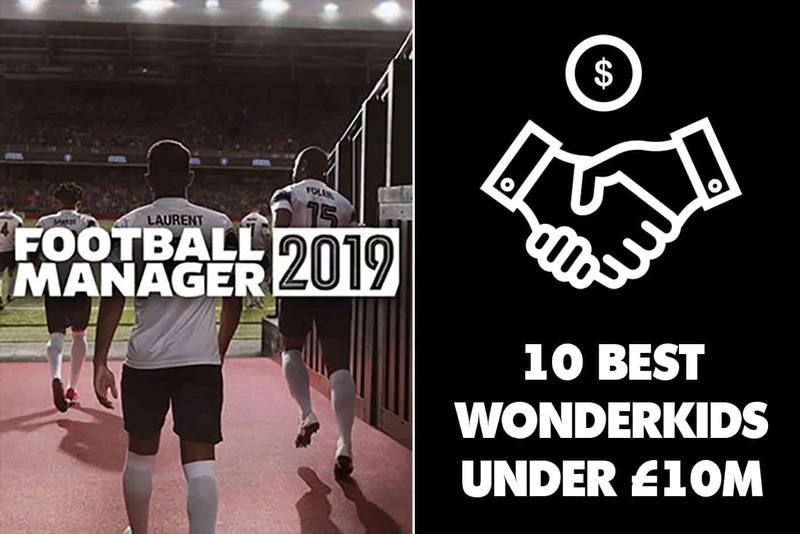 PlugsvilleSport has compiled a list of 10 of the best high-growth FM19 cheap wonderkids to sign for under £10m. We have listed each player’s age, club, nationality, position(s), five best attributes and estimated transfer cost. Not sure how much money each team starts with? Check out our list of starting transfer/wage budgets which features over 150 teams across eight leagues by clicking here. There are many bargains to be found when scouring second division sides, which means those players are also likely to be cheaper than those who play for more reputable clubs. Morilla is one the best for his age in FM19 an also one of the cheapest, courtesy of his £1.6m release clause. Because he plays for a team in the Spanish second division in Sporting Gijon, Morilla can be signed by most sides for a modest fee and carries five-star potential, making him a hard proposition to pass up on. Vagnoman is another who is relatively easy to sign given that his current club currently reside in German football’s second tier and can easily become your next right back for many years to come. The German youngster is first-team ready and can be relied on to produce average performance ratings above 7.00 from the get go. At 17 and available for less than £10m, Vagnoman is a must-buy and can also cover at left back when needed. Dubbed as the ‘next Pirlo’ and already rated as a £30m midfielder on the radar of Liverpool according to some media reports, Tonali is sure-fire among this selection of FM19 cheap wonderkids and is worth every penny. You’re better off signing the Brescia midfielder sooner rather than later while he’s still cheap, as he is someone who will benefit from training at a better side, even if you don’t put him in the first team straight away. With five-star potential and excellent quarterback-like playmaking talent, Tonali would be a welcome addition for most sides in FM19. Olmo began his career at Barcelona but has since been yearning his craft at Croatian outfit Dinamo, who have trained him up to become a goalscoring left midfielder who can be signed on the cheap in Football Manager 19. The young Spaniard can usually be signed for a modest fee and isn’t a stash-and-store prospect either. Olmo is someone who is best eased into your team, but doesn’t take too long to find his feet and provide goals and assists in abundance. Ajax have long been known as a conveyor belt of talent, with the latest illustration of that theory coming in the form of Frenkie de Jong’s £65m switch to Barcelona, with former team-mate Matthijs de Ligt expected to also leave the club for a huge sum in the coming months. Gravenburch is one of the club’s lesser-heralded talents and at 16, he is raw, but will definitely benefit from strong coaching and a loan spell or two to fulfil his four-and-a-half-star potential. The second youngster on Dinamo’s books to feature on this list, Marin desirability stems more from his potential than his current ability, but given his low transfer fee, he is worth a purchase as someone to develop in the long run. Despite his raw ability, Marin is already armed with tools that hint towards an explosive player once fully developed, with impressive dribbling, technique and flair to go with decent pace and fitness. Trincao is a signing who may not be able to contribute right away but possesses strong technical tendencies that make him one to watch in future. If you have a few million left over after your first spending spree, stretch out a few million for the Braga youngster and thank us later. Stengs is set for a breakthrough in AZ’s first team at the start of most game saves but if act quickly you can signup before his price rises exponentially with first team football. He begins the season nursing a knee ligament injury but once healthy his fitness is usually above par and his set-piece abilities make him a potentially important assets in years to come. If you’re in need of a serviceable striker who can shine in European football, look no further than Brenner. The young Brazilian has decent pace and good technical ability for someone his age, so he is best utilised as an advanced forward. His finishing has room for improvement but his five-star potential will help to ease any concerns you have with his current ability. Given that he plays for Bayern, you will have to be managing a fairly decent side to prize away Fruchtl from a shot at succeeding the formidable Manuel Neuer, but it can be done, depending on how much you’re willing to fork out. Bayern’s loss can become your gain as Fruchtl arrives with high potential but would benefit from at least a season of first football on loan elsewhere to aid his development.